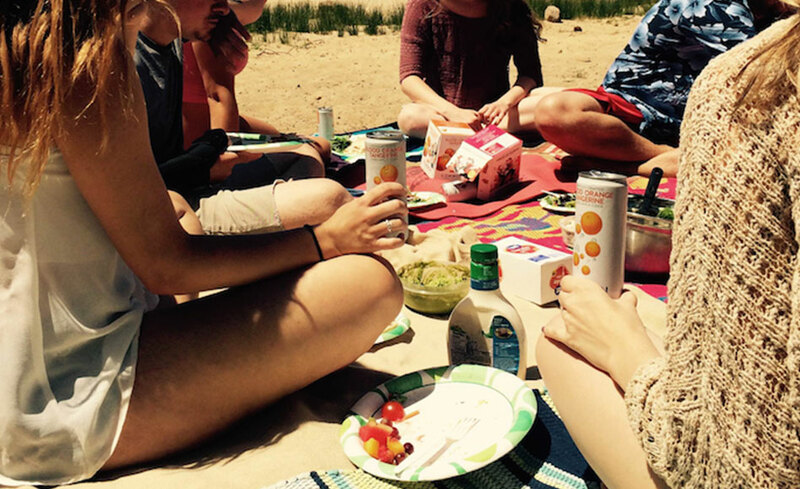 An impromptu picnic on the beautiful shores of Lake Tahoe turned out to be the perfect setting for Common Cider last month—the cans were easy to tote along and made a joyful pairing with our simple, gluten-free menu and, of course, friends! For our King’s Beach get-together, we crafted some delicious dishes, including fruit salad, green salad, and chicken tacos. With ten friends involved, last-minute meal prepping was a breeze. The fruit salad combined six different summery fruits—a great compliment to both Hibiscus Saison and Blood Orange Tangerine flavors—and the chicken tacos were as easy as 1, 2, 3: shredded rotisserie chicken, corn tortillas, and all the traditional condiments, like queso and guacamole. Baby greens, cucumbers, tomatoes, feta cheese, dried cranberries and honey roasted walnuts made for a delectable, healthy side dish with almost no effort! We loaded up the coolers with Common Cider cans, lots of ice, our picnic fare, and headed down to the beach. After an enjoyable afternoon at the lake tossing around the Frisbee and soaking up rays of sunshine, my friends and I reveled in the crisp, refreshing taste of Common Cider as we munched on our menu of salad and tacos. This was our JOY. What’s yours?